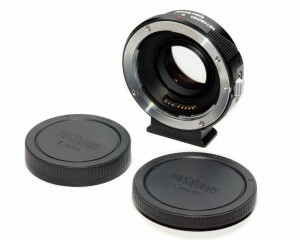 Camera Hire has just added a Metabones Speed Booster to its hire inventory. The Speed Booster enables the mounting of Canon EF lenses to Sony NEX-mount cameras, such as the Sony NEX-FS700. The Metabones Speed Booster increases your maximum aperture by 1-stop, and shortens the focal length of your lenses by 0.71x. Because the Sony FS700 crops lenses by 1.6x, the Speed Booster effectively eliminates this crop, giving you back your wide-angle perspective. Metabones® and Caldwell Photographic jointly announce a revolutionary accessory called Speed Booster™, which mounts between a mirrorless camera and a SLR lens. It increases maximum aperture by 1 stop (hence its name), increases MTF and has a focal length multiplier of 0.71x. For example, the Canon EF 85mm f/1.2L II lens becomes a 59mm f/0.9 lens on a Sony NEX camera, with increased sharpness. The faster F-stop allows for shallow depth-of-field and a lower ISO setting for decreased noise. Speed Booster is also particularly pertinent to ultra-wide-angle SLR lenses. The combined focal length multiplier of Speed Booster and an APS-C mirrorless camera is approximately 1.09x, making the combination almost “full-frame”. Full-frame ultra-wide-angle SLR lenses largely retain their angle-of-view on an APS-C mirrorless camera when Speed Booster is used. Speed Booster serves double-duty as a lens mount adapter, from Canon EF lens (but not EF-S) to Sony NEX, with auto-aperture, image stablization, EXIF and (slow) autofocus support for late-model (post-2006) Canon-brand lenses. The Metabones Speed Booster is now available for hire from Camera Hire.